Providing you the best range of table top sieve shaker and gyratory rotap sieve shaker with effective & timely delivery. Fitted with FHP motor, it can accommodate six sieves of 8"dia. Speed can be regulated through a continuously variablespeed regulator fitted to the unit. Automatic 0-60 minuted "GERMAN" Timer. This is suitable for heavy materials, powder or granules. It is run by 1/4 HP electric motor through a reduction gear. 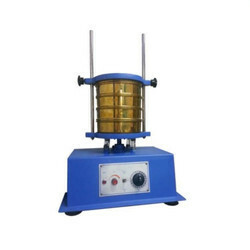 It can accommodate up to 8 Test Sieves of 8" (200mm) dia x 2" (50mm) height with one set of upper lid and bottom pan.Gyratory action involves upward and downward movement of the table. Standard gyratory motion produce inclination from the vertical axis and the direction of inclination changes continuously in the clockwise direction. Rotap Sieve Shaker. 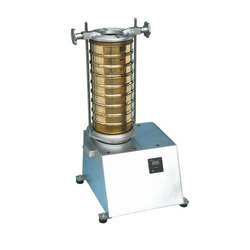 The Sieve table rotates in 45-degree direction, which makes each square inch of the sieve analysis possible. Looking for Industrial Shaker ?